The Farina-bodied BMC saloons would become ubiquitous Sixties fare. We examine an early verdict, courtesy of The Autocar. The very first of a new generation of Pininfarina-bodied medium saloons from BMC, Wolseley’s 15/60 model was introduced in December 1958 before going on sale in 1959. This new series would take BMC’s multi-marque strategy to previously unheard of heights (some might choose to invert that statement), with a succession of models quickly following, all sharing identical bodies and technical specifications, apart from minor changes to engine tune and detail styling. Widely derided as ‘badge-engineering’, it proved a commercial success for BMC, but one which ultimately came with a reputational cost. The Autocar published its first road test of the 15/60 on 13 March 1959. The test car retailed at £991.7s, including purchase tax. Not (then) noted for sensationalism, The Autocar writer’s style was drier than a chilled glass of Tio Pepe, but with a little gentle sifting one can glean the degree to which their enthusiasm for the car lay. A good example of Autocar pulling its punches was its observation regarding perhaps the most significant mechanical change to that of its Nuffield predecessor. “In the steering layout the 15/60 differs widely from the earlier 15/50 model, which had a very accurate rack and pinion layout; a cam and lever design is now used.” This alteration was a likely consequence of the ascendancy of the Longbridge engineering department over that of Cowley, where the previous car was developed. However it was suggested that the car’s suspension settings were overly soft and that the car felt underdamped at speed and prone to body roll when laden with a complement of passengers. The ride quality however was praised, testers observing that “on a good surfaced main road at up to 60 mph the ride is comfortable.” One thing they neglected to impart however was exactly to what degree ride and handling departed from acceptability on rougher roads or at higher velocities. Additionally, the Wolseley’s overall refinement was marred, by a “pronounced body drumming” between 60 and 70 mph. As befitting an upmarket nameplate, the Wolseley’s interior came with the trappings of one-upmanship; real leather for the seat facings, polished veneer for the facia and door cappings and deep pile carpeting throughout the cabin. The driving position was praised by the test team, as was the comfort and support from the driver’s perch. The modern design of the main instrumentation, positioned in front of the driver beneath a hooded binnacle failed to prevent screen reflections for taller drivers. DTW regulars will be relieved to learn that the 15/60 came with a standard rear centre arm rest which Autocar cited as being the primary provision of lateral support for rear occupants during spirited cornering. However, marks were lost in the vexed arena of smoking provision, the two door-mounted ashtrays being inconveniently sited. Autocar‘s test team suggested a larger centrally mounted receptacle might have been preferable. A further demerit was levelled at the finish of the stainless steel window frames, the sharp edge of which caused one of the test team to tear the sleeve of his standard auto journalist-issue raincoat. 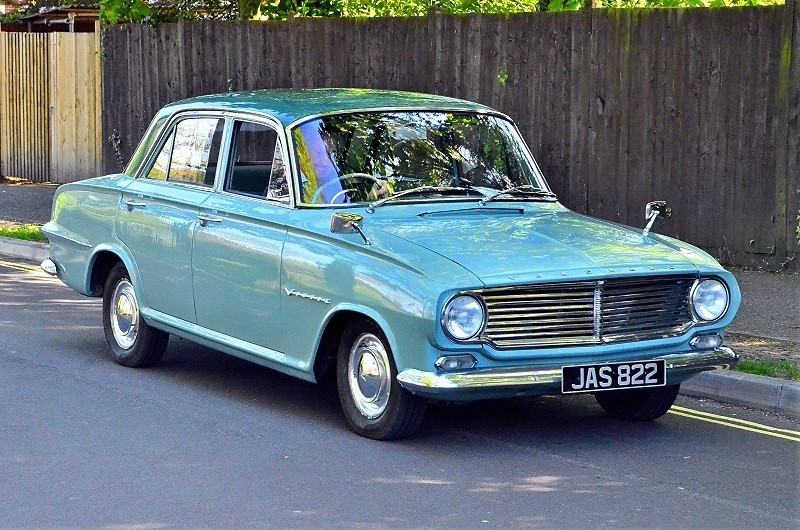 Little mention was made of the Wolseley’s body styling, apart from noting that it was designed by ‘Pinin Farina’; the feeling being that such matters were subjective, and not the purview of a magazine such as Autocar. Testers confined themselves to practicalities such as observing the “tops of both wings can be seen without the driver having to lean forward and the large rear window gives a view of the upper corners of the tail fins, which is of great value when reversing.” However, it was found that the “new body lines” entailed screen pillars which impeded the driver’s view “at some angles”. Archie Vicar’s view of the ’59 Farina saloons is unknown. Interesting to compare to the Ford Falcon introduced in 1960. 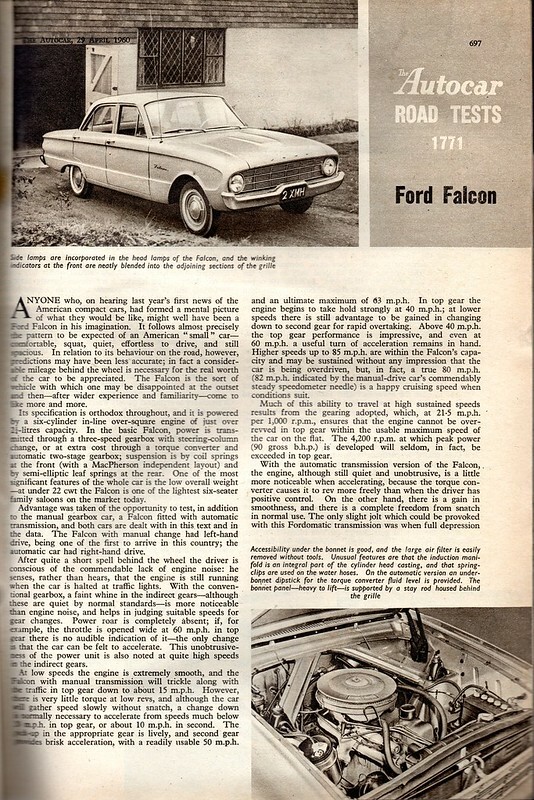 Surprisingly, the Falcon is less than 100 pounds heavier than the Wolseley, despite seeming to be a much larger car with a 6 cylinder engine and an automatic transmission. The problem with the Falcon was the flimsy tin body. The Oxford was far more rugged. But the existing English Ford Consul and Zephyr sold at the same time as the Falcon in Canada really showed up its flimsiness. You can read more about the difference in ruggedness on Curbside Classics from other colonials like Kiwis and Aussies who also had both Fords. My Dad had a Consul, 92,000 miles, only exhaust systems replaced in six years running in rural Nova Scotia with a lot of gravel roads. Tough old birds. Falcons were like Anglias and Cortinas, thin sheet metal and gasping for relief after four years – disposable things. Sure the Mustang was based on it. They rusted away too. I think Bill’s right about the flimsy Falcon, it is 100-300 pounds less than similar sized Valiants and Chevy 2 while being similarly sized and equipped. BTW for any who are interested, there is a collection of hundreds of car review scans of the 50’s to 90’s from Autocar, Car, Motor. oops, sorry all about the wrong photo. It was a bit of an ugger that short-lived first generation Pininfarina load of BMC cars. The tailfins were much too large and bulbous somehow at the same time. Perched up high on a narrow track, it looked a bit gauche. But have no fear! In those days, at least the body was reasonably rugged, and BMC management still had eyes. So in 1961 they updated the styling. Unlike most updates, this one looked far far better than the original, and they made it for a decade. I think people forget that it trundled along almost until the Allegro tin box debuted. When I went to a rurally located university in autumn 1963, eventually I made a pal in the same year who owned a ’62 Oxford. Both of us were lucky enough to land a summer job at the Physics Dept in 1964. My first job! Money! He was well off but unostentatious – his mother had bought him the car before he sallied forth from the family nest. We motored all over the place that summer, 1622cc of roaring power, emphasize the roaring. In those days, the campus was dead as a doornail in summer, and closed from late April until early September. On his last trip home for a weekend 150 miles away, upon his return, no car! The car had croaked and was in for repair, running extremely roughly. Being all of 18, my friend had decided that adjusting tappets would be an enlightening exercise. Armed with the specs from the manual, some feeler gauges and correct wrenches, he did it with engine cold, engine hot, and engine running. The latter was a squirty oily exercise. Must have done it half a dozen times that summer. Well, long story short and no surprise, the valves were roasted. When we all came back at the beginning of term after 10 days off, I sought him out of course. Blow me down, his Mum had bought him a ’62 Volvo 544 just 18 months old. With a properly located 3 trailing arm and Panhard rod coil spring rear suspension (far superior design to that Riley Ditchinder job, in my view), it both rode and handled better than the dowdy Morris, despite its ancient looks. It had the now legendary B18 twin carb engine. 0 to 60 in 12 seconds instead of eternity, 75 mph in third! Beaten like a dead horse, it went trouble-free until 1968 when his Mum bought him a rocketship Barracuda 340 – a very good car in my opinion. 0 to 60 in six seconds. The Oxford Series II had one redeeming feature, carpets instead of the standard rubber floor that so many cars had in those days. Other than that, it was a good family car, not suitable for a teenager who at heart wanted a sports car. Well, lots of both were on our roads as I grew up. Nobody ever confused them; the Falcon was droop-snooted in person and much bigger. It also had more side-scalloping and round tail lights. The Victor looked better, I think. Given the similarity in styling theme to that of Lancia’s 1957 Flaminia and the Peugeot 404 from 1960, it can be said without fear that the BMC cars were the least successful from a visual perspective. The primary reason, as far as I can see is that the body appears to be draped over underpinnings which predate it, meaning the wheelbase appears too short, the rear overhang too long and the wheel tracks too narrow. Peugeot got the better deal from Pininfarina it would seem, or perhaps the Italians were allowed more autonomy than Lord Lord would allow. The 404 simply looked right from day one and tellingly, required no mid-life (or in the case of the BMC cars) early life facelift. These ‘Farina’ saloons were ubiquitous in Ireland when I was growing up – Cambridges and Oxfords in the main. Mechanically very durable, the bodies however rotted with staggering enthusiasm. particularly in the perennially damp conditions which predominate here. The A60 was made until around 1971, if I recall – largely as a consequence of the Maxi debacle. The Marina which succeeded it was never a particularly popular car in Ireland. The taxi drivers and farmers who made up the bulk of the customer base had migrated to Ford by then and later, Toyota/Datsun. Still, I have vivid memories of seeing these on rural roads into the early ’80s, bouncing along on shot dampers, the bootlid strapped down with bailing twine, rust eating away the bodyshell’s integrity, but still smoking in something approximating a straight line. The full horror of BMC´s badge-engineering sinks in here. Where other maker had trim-levels L, DL, GL, GLS etc this bunch of cretins had a badge and a grille for each level up the trinkets and trim ladder. This and GM´s 1980s branding strategy are without doubt the most staggering examples of lousy brand stewardship and marketing idiocy. We´re nearly the same vintage, Eoin: I have no recollection of seeing these cars when I was trotting as child around Dublin. I ought to have been able to see decade old-cars around 1980-somthing. Even by then they must have seemed really archaic. As I have said before, a decade-old car in 1980 looked old, wrecked and outdated. To my eyes few 20 year old cars look that way. I´d have to go back a quarter century to start to view a car as being an obvious pensioner. The difference between BMC Farina models and GM in the 1980s is BMC saved money by using the same stampings except for hoods, while GM in the 1980’s had a bunch of cars that looked the same and the stampings were all actually different ! Weren´t some of them very similar that way too. The Buick Century, Pontiac 6000, Olds Gutless Ciera had common panels; the Chevrolet Caprice and Buick Roadmaster would be another (later). I thought some 70s GM cars had sets of nigh-on twins and triplets with different front clips to distinguish them. I do think your point is clear, GM had all the disadvantages of badge engineering and managed to avoid the advantages. BMC acted as if they had given up. I wonder what drove them to think it made sense to offer marque-loyalists such obvious impostors. Richard, remember that the last of the A60s would only have been 10 years old in 1981. Admittedly they generally looked a good deal older by then, especially once the climate had taken its toll, but perhaps cars were changed more regularly in affluent Dublin than in the more impoverished Southern counties. But given the lack of vehicle testing at the time, as long as it could move under its own volition, it could be driven – within reason at least. That’s the amazing thing. If you look at a 1987 Celebrity, 6000, Century, or Ciera the hood, trunk, front fenders, rear fenders, C pillars and maybe roof stamping are unique to each. I “think” the doors are the same, but even there, there are several shapes of the rear doors around the rear wheel arch that suggest maybe those stampings were different as well. It would have been madness to have different doors and door rings on cars that looked so similar. But it was GM in the 1980s, so almost anything is possible. Angel: And they tout commercial organisations as models of efficiency. My study of images of those cars was not thorough enough. Their approach to platform engineering could be contrasted with VAG´s and indeed GM´s later efforts. I suppose they were still learning. Richard: for GM in the 1990s, if anything, they were even more inefficient. If you look at the 1996 Buick Lesabre and Park Avenue, Olds 88 and 98 and Pontiac Bonneville; those cars all shared the same wheelbase and still look pretty similar but the front fenders, hoods, rear quarters, trunks and roof are unique (Olds shared a hood). There are 3 sets of door skins (Old 88 and 98 shared, similar for the Buicks). However, the upper doors are not the same and those cars had a “uniside frame” with a single stamping for the door rings. The door rings are unique for all five cars ! In addition, there are multiple versions of the inner reinforcements for the B pillars (???). There is a story there of industrial scale waste, inefficiency and incompetence that extends across their platforms, well beyond what’s been documented about the GM10 W bodies. ““In the steering layout the 15/60 differs widely from the earlier 15/50 model, which had a very accurate rack and pinion layout; a cam and lever design is now used.” The Autocar´s writers were quite subtle, weren´t they. I am sure the chaps in BMC House could decode that as “the steering is worse than on the outgoing car”. The question is, were readers too thick-witted to notice or is it more that these days we´d assume readers would be too slow to understand that is clear if implicit criticism. I mean to ask do we make the mistake of reading 1960s text with the assumptions we have of modern text? Today they´d just write “the new steering is not as good the outgoing car” or “the steering is twenty times worse than a tug-boat’s on a storm-force sea”. Good morning, Eóin and Richard. I share your memories of ancient cars in rural Ireland in the 1970’s and 80’s, in my case Galway. It’s amazing what you could bodge with some bailer twine and a bit of imagination! Those Farina BMC models were absurdly outdated looking but still just about mobile, most with rotten sills, door bottoms, wheelarches and boot lid bottoms. The only panel that didn’t seem to rust was the roof. I remember an acquaintance of my family pop-riveting large pieces of aluminium to the lower bodysides, then slapping on the Isopon to hide the rivet heads and roughly approximate the shape of the disintegrating panel underneath, all to little avail as the rot progressed so quickly. Another acquaintance used copious amounts of chicken wire, rolled into tubes or spheres, to stuff the rotten cavities and provide something for the filler to adhere to. Richard, you make a good point about decade-old cars then compared to now. Then, they were mainly rust-buckets and clapped out mechanically. Now, most look perfectly fine, especially if well maintained. An elderly acquaintance of ours drives a T plate (1999/2000) Mk4 Golf and, apart from some minor parking stuffs, it still looks very respectable. It is regularly serviced by a local mechanic but, otherwise, receives no TCL. You can buy TCL in 300g cans from Allied Autospares. It´s very good indeed but hard to clean off concrete and asphalt so make sure you put down protective paper or plastic. It also smells awful and the smell lingers. I think it´s an epoxy compound. To put those Farina abominations into perspective with what was 10+ years old when they were new – those of us who were just beginning our car driving lives at the time looked on them with complete contempt and did everything we could to dissuade our parents from replacing ageing ZA Magnettes, Riley RMs and the like with such obvious parodies. The only Farinas to actually sell in reasonable numbers were Austins (always pronounced “Orstin”), particularly popular with Commercial Travellers because of their capacious boots (trunks) and mechanical endurance. We who were delighting in our Minis (not me – I thought the Imp far superior) encouraged our older relatives to buy Cortinas, even Victors and Minxes for heaven’s sake – anything but a BMC Farina! Or, if they could afford it, a Citroen DS. And we succeeded – Morris loyalists turned to Vauxhalls (wouldn’t be seen dead in a Ford), those who appreciated the engineering or driving qualities of their “proper” Rileys, MGs, Jowetts, Lea Francises . . . shook their heads and looked to France, Italy or Germany for replacements. And there you have the final decline of the British motor industry lurching off into the sunset. It could only get worse – and it did. Have you by any chance seen Archie Vicar´s review of the Imp which is available here on these pages? You might find it very interesting in the light of your remarks. The question is, how is it that Archie Vicar did not get a chance to review any of these BMC cars? The Vicar archive is huge and so far I have not come across any reference to these cars. How odd. It´s like a Bermuda Triangle of his career. Thank you Richard; an entertaining piece although slightly worrying – Mr Vicar’s imaginary distilleries (including one with the Irish spelling of ‘Loch’) have me wondering if he ever really managed to pack bottles of the stuff under the bonnet. Either that or he had felt the need to become pickled enough to erase the memories of very recently sampled BMC fare, hence the subsequent lack of reference to them? And he’d sobered up by the time he got to Caperdonich. John: I think you will find these distilleries did exist at some point. The “loch” must be a typo but there is Loch Lomond which is the local spelling. The Irish equivalent is Lough, pronounced the same way to rhyme with “knock”. I think there’s something clown-esque or circus-like about this car. I don’t know if it’s the two-tone paint job, the oversized fins or the round headlamps….